Spring is my favorite time to decorate. 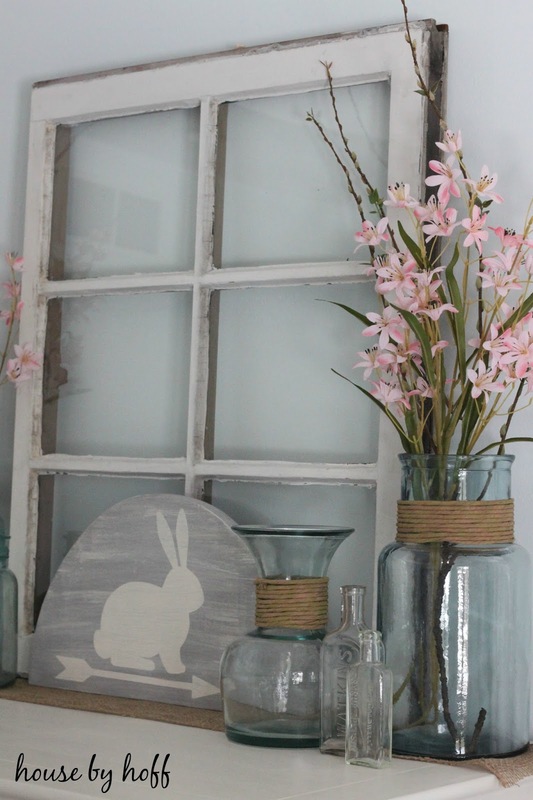 The light color palette, the flowers, the sprigs, the birds, the bunnies….I just love it! I’m on a spring decorating kick, and I took on my master bedroom this weekend. I threw some stems of fake pink flowers (from Michael’s) into some pretty blue vases (from Home Goods). I added some of my favorite vintage accessories, and changed out the mirror that usually sits on my dresser for an old window. I’m a sucker for vintage glass. I love the layered glass look! I had to chuckle at my “window on window” look. What can I say? I love old windows! See my old window to bathroom towel rack tutorial here. so happy and i LOVE the bunny sign! 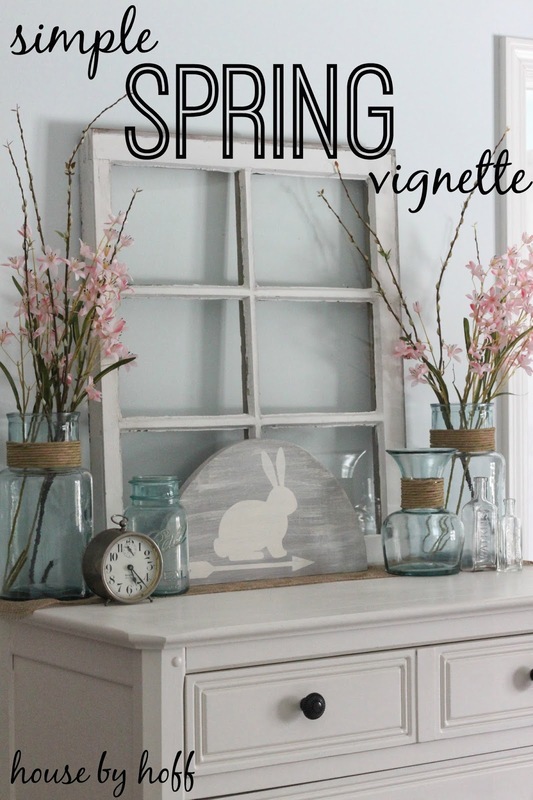 LOVE the windows & the bunny is too cute! It looks very pretty! 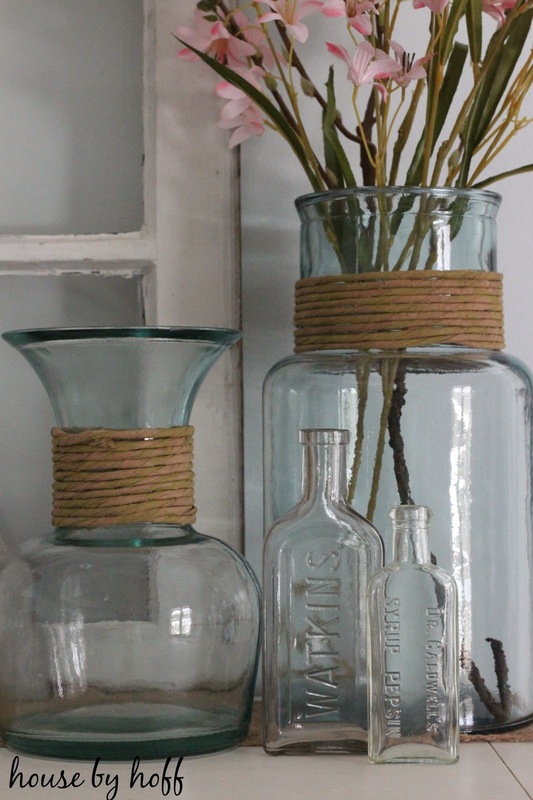 Love the twine on the bottle necks. Hi April, What a pretty spring display! Can you please tell me your paint wall color? I heart it so much! Thank you! Very cute April! I love the bunny too! Thanks April. I never used Dutch Boy. Did you like using it? I usually use SW or Behr. Thanks April. I will give DB a try. I agree. The twist off lid and pour spout are awesome. I like spring decorating too. I think it’s the colors and the sunlight! LOL. Your display turned out wonderful. I love how it’s simple with a punch! 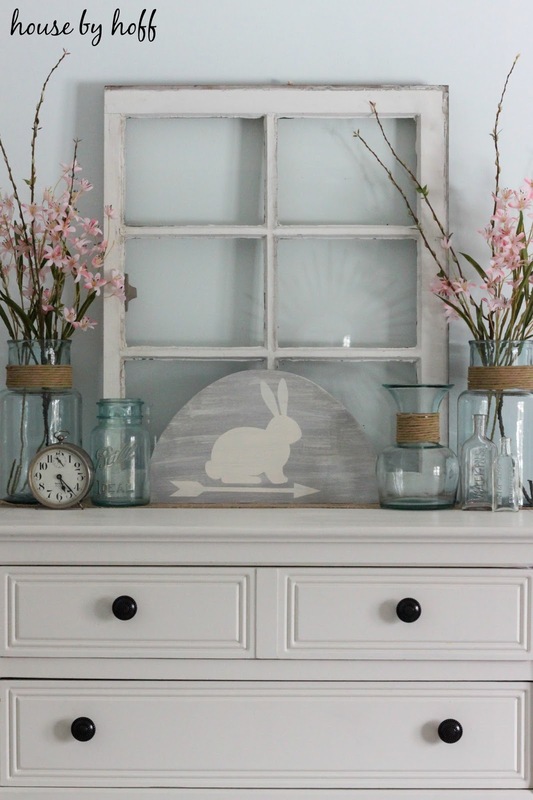 I love that little bunny sign! It’s so cute, I can’t wait to see the tutorial! Love it! I love the pink sprigs which add a soft color. Love the bunny sign too!! So, so pretty, April. Love the delicate pink and gray mixed together. And love that bunny sign too – I’m a sucker for bunnies! Can’t wait to see the tutorial for it. Thank you for linking up to Swing Into Spring and happy first day of spring! 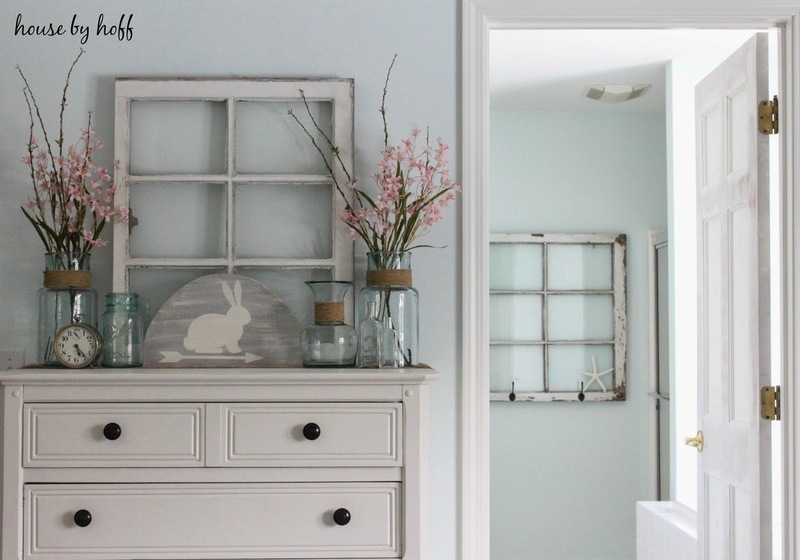 Love your simple vignette! 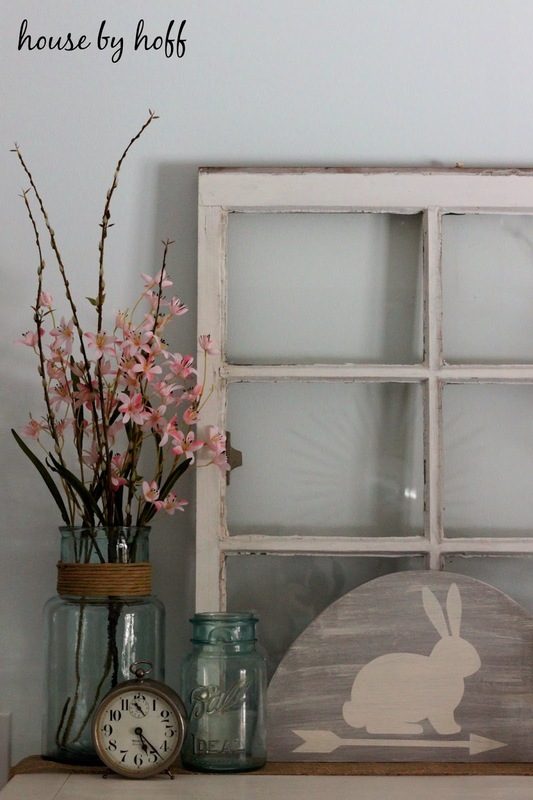 I have an old window I re-did in my bedroom, but I’m itching for another – there’s just so many ways to use them.